And The Winner Is…. Kattwalk Salon! 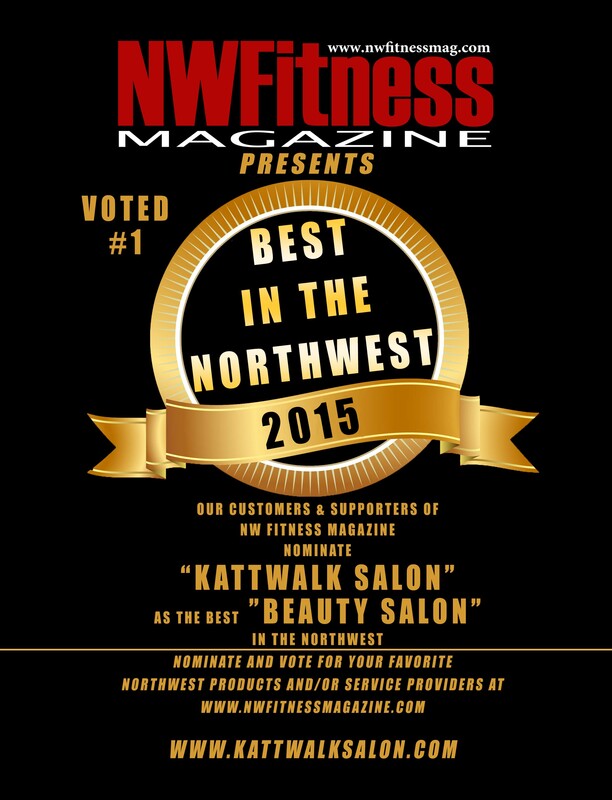 NW Fitness Magazine Presented This Award of Excellence to Kattwalk Salon and its Owner Leann Hickel. Kattwalks passionate supporters, loyal customers, and NW Fitness Magazine have recognized Leann Hickel for her continued commitment to high standards and outstanding service. 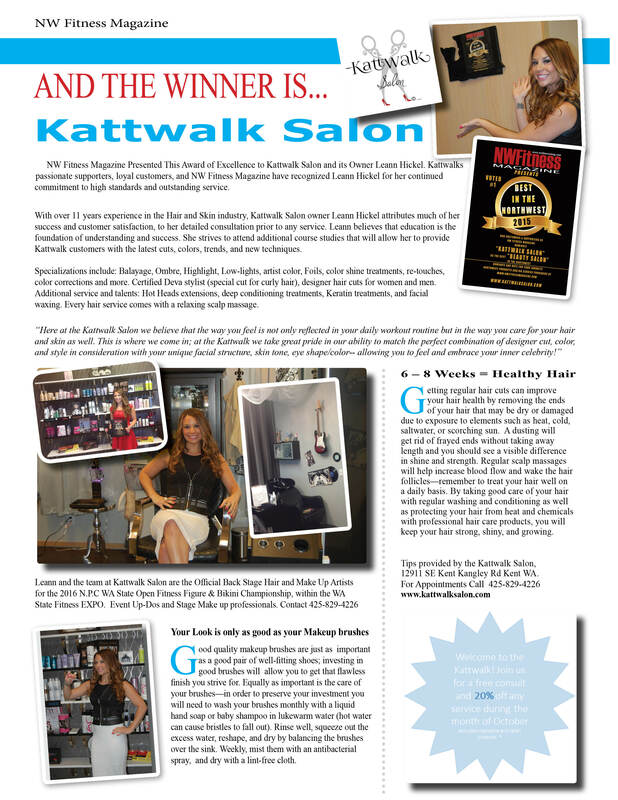 With over 11 years experience in the Hair and Skin industry, Kattwalk Salon owner Leann Hickel attributes much of her success and customer satisfaction, to her detailed consultation prior to any service. Leann believes that education is the foundation of understanding and success. She strives to attend additional course studies that will allow her to provide Kattwalk customers with the latest cuts, colors, trends, and new techniques. Specializations include: Balayage, Ombre, Highlight, Low-lights, artist color, Foils, color shine treatments, re-touches, color corrections and more. Certified Deva stylist (special cut for curly hair), designer hair cuts for women and men. Additional service and talents: Hot Heads extensions, deep conditioning treatments, Keratin treatments, and facial waxing. Every hair service comes with a relaxing scalp massage. Good quality makeup brushes are just as important as a good pair of well-fitting shoes; investing in good brushes will allow you to get that flawless finish you strive for. Equally as important is the care of your brushes—in order to preserve your investment you will need to wash your brushes monthly with a liquid hand soap or baby shampoo in lukewarm water (hot water can cause bristles to fall out). Rinse well, squeeze out the excess water, reshape, and dry by balancing the brushes over the sink. Weekly, mist them with an antibacterial spray, and dry with a lint-free cloth. Getting regular hair cuts can improve your hair health by removing the ends of your hair that may be dry or damaged due to exposure to elements such as heat, cold, saltwater, or scorching sun. A dusting will get rid of frayed ends without taking away length and you should see a visible difference in shine and strength. Regular scalp massages will help increase blood flow and wake the hair follicles—remember to treat your hair well on a daily basis. By taking good care of your hair with regular washing and conditioning as well as protecting your hair from heat and chemicals with professional hair care products, you will keep your hair strong, shiny, and growing.